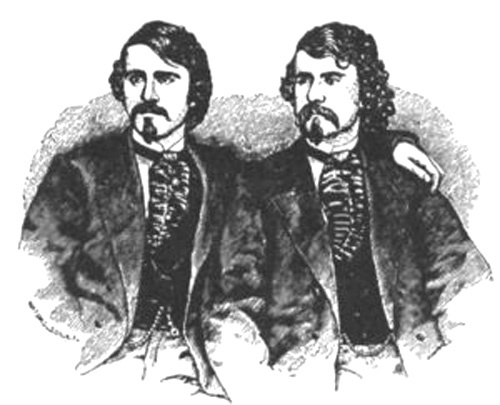 Ira Erastus Davenport (1839–1911) and William Henry Davenport (1841–1877), known as the Davenport Brothers, were American magicians in the mid 1800s, sons of a Buffalo, New York policeman. The brothers presented illusions claimed to be supernatural. The Davenports' most famous effect was the box illusion. 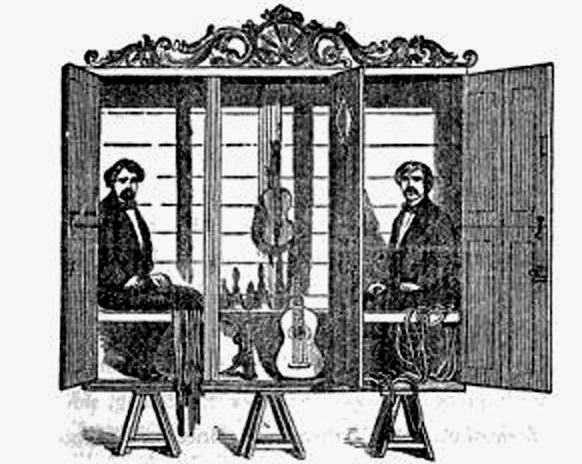 The brothers were tied inside a box which contained musical instruments. Once the box was closed, the instruments would sound. Upon opening the box, the brothers were tied in the positions in which they had started the illusion. Those who witnessed the effect were made to believe supernatural forces had caused the trick to work. They toured the United States for 10 years and then travelled to England where spiritualism was beginning to become popular. 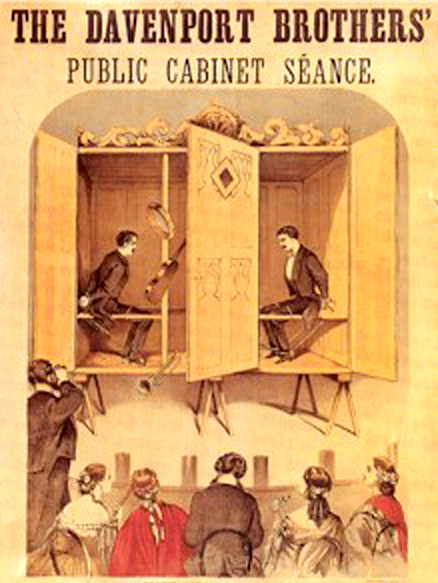 The Davenport public séances began in October 1864 at the Queen's Court Concert Rooms, Hanover Square, London. They continued almost nightly until the end of the year. 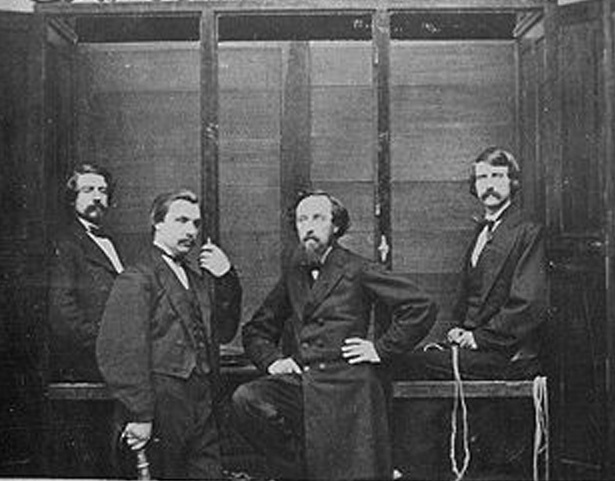 No committee could pinpoint the brothers' fraud, though a group of stage magicians attempted to prove that the performance was fraudulent. Another view of the Cabinet, showing ropes and musical instruments prior to the "Séance"
Although their stay in London was somewhat successful, the Davenports met with open hostility in the countryside. In Liverpool, for example, two members selected from the audience tied the mediums with a peculiarly intricate knot. The mediums protested that it was unfairly tight and injured their circulation. A doctor from the audience made an examination and pronounced against them. The Davenports refused to sit and asked Ferguson to cut the knot. The next night a riot broke out and the party left town. At Hull, Huddersfield, and Leeds they found a hostile public, inclined to lynch them. Since they did not find the police protection sufficient, they broke off their engagements and returned to America. The “two members selected from the audience” in Liverpool were John Hulley the famous gymnast, and Robert B. Cummins. Their confrontation with, and eventual exposure of the Davenport Brothers filled many column inches of both local and national newspapers for several weeks after the event, most of which are reproduced below. Included in the reports are several from the Porcupine magazine, a 19th century fortnightly journal of current events - social, political, and satirical in Liverpool. The Davenports’ exposure also led to a County Court action being brought by Cummins to recover the entrance fee of five shillings paid to see a séance which did not come off. The judge found against Mr Hime, the Liverpool agent of the Davenports who agreed to repay all persons affected.